Gridlandish is the name that I have given to the grid that I designed for my portfolio project. It is not related to an RPG game that I found called Gridland (Doublespeak games, 2014). It is quite difficult to come up with a completely original name with the word “grid” in it, it seems. The name is really inspired by the fact that my grid is the opposite of the word, Outlandish – it is very square! 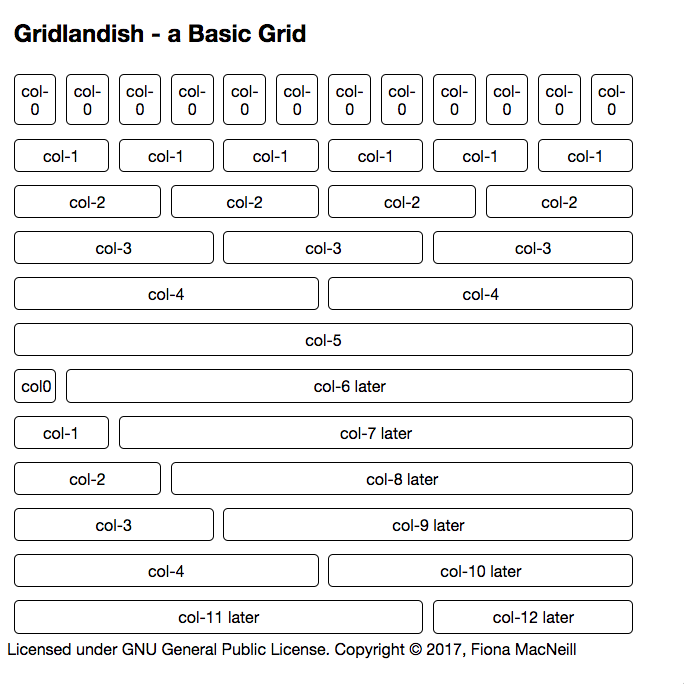 The html and CSS for Gridlandish are included at the bottom of this page. The mobile re-sized version shown in an iframe of 470px representing the basic media query in the template. Breakpoints are properly established in the version used in my portfolio site. although it is basically identical to col-9.